White camphor leaf essential oil from China. Species: Cinnamomum camphora. Family: Lauraceae. Class: Oxide. CAS: 8008-51-3. 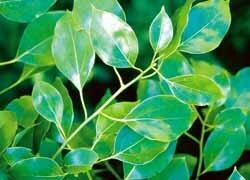 Camphor eesential oil is used in aromatherapy for respiratory congestion. Here is an article: Health Benefits of Camphor Essential Oil.